In two recent issues, I addressed various symbolic motifs in the Caucasian rugs from the Second Golden Age of Oriental Rug Weaving (ca. 1800 to ca. 1910) and how they reflect the philosophy of the tribal culture from which they stem. In this installment, based on innumerable conversations I have had over the past 35 years with descendants of the tribal weavers I explore three archetypal motifs relating to the depth of character that can be gained by overcoming adversity in life. One commonly employed symbol, “The Mountain”, is represented in a sharp zigzag line often seen in the rug’s guard border. One commonly employed symbol, “The Mountain,” is represented in a sharp zigzag line often in the rug’s guard border. The Mountain depicts not only the towering peaks that surrounded their villages or encampments, but the power and stability of the earth and the need to climb up both literally and figuratively in order to see things more clearly. The weavers believed that by developing an inner wisdom that the attribute of constancy represented by the mountain could be available within oneself. Another commonly used symbolic motif has been translated as “Climbing Strength.” The weavers saw the earth as a remarkable training ground in which by overcoming life’s continual challenges, one may eventually gain the ability to face its next demand with clarity and integrity. In time, one may gain sufficient inner resilience that they can fulfill this inevitable task with a willing, even joyous attitude. 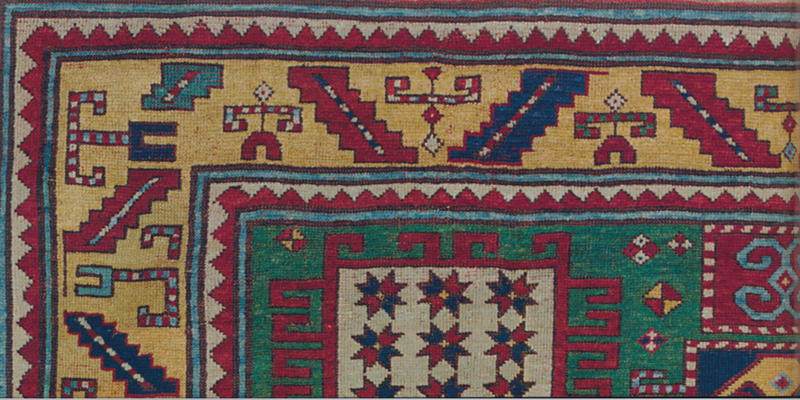 The eight-pointed “Star of Wisdom” seen throughout Caucasian rugs depicts man’s potential to develop understanding. 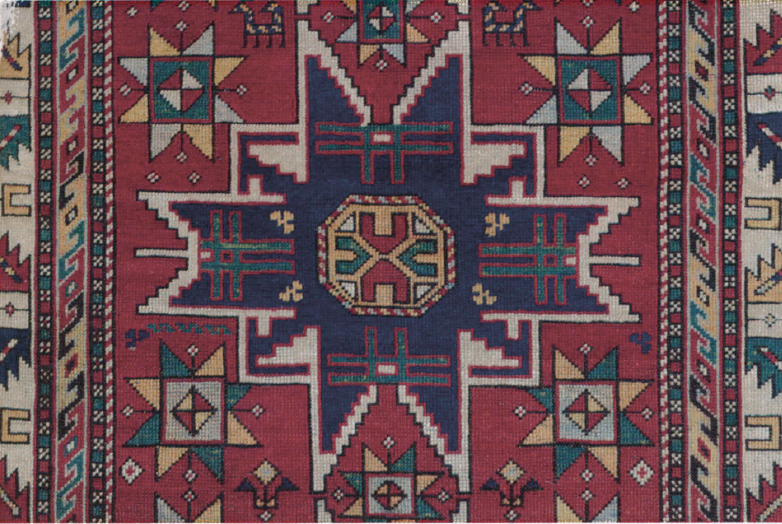 The eight-pointed “Star of Wisdom,” seen throughout Caucasian rugs depicts man’s potential to develop understanding. The Caucasian tribespeople lived an elemental lifestyle with minimal possessions. They believed that wisdom obtained through overcoming the many challenges of daily activities was one’s greatest possession. 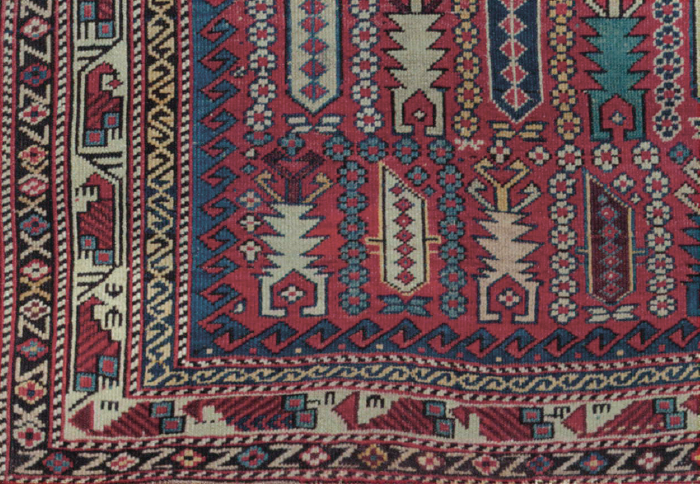 The most accomplished antique Caucasian rugs reflect both the dexterity and integrity of their weavers and the cultural tradition of the region. The often harsh physical environment of the Caucasus Mountains and their awe-inspiring beauty inspired the most talented weavers to create rugs that depict many important aspects of tribal cosmology in a profound and often whimsical fashion. Close examination reveals that their weavings are replete with enigmatic designs whose deceptive simplicity reveals great philosophical depth. In the next installation of this series, I will explore how the pattern language and color palettes of Caucasian rugs are an expression of the weavers’ belief in an underlying harmony and unity in nature and in the cosmos.